We’ll be the first to admit that we were among the many people who wrote off M. Night Shyamalan a long time ago, back when he was putting out duds like Lady in the Water and The Happening. What started off as a tremendously promising career took a sharp nosedive rather quickly and never fully recovered – until now. Starting in 2015 with The Visit, the director slowly but surely began to get back on a more positive track, one which eventually led to this year’s Split. Starring James McAvoy, it was a huge hit for Shyamalan and has now put him back in the good graces of both critics and audiences alike. Not only that, but it’s paved the way for the long awaited Unbreakable 2, given that it featured a cameo from Bruce Willis’ David Dunn at the end, revealing that both films were set in the same universe. Now, the director’s hard at work on the conclusion to a story that started all the way back in 2000 and today, he’s provided a quick update. After telling us a few weeks ago that he’d written an 11-page outline for Unbreakable 2, Shyamalan has taken to Twitter to announce that he’s now writing the first draft of the screenplay. Well, actually, he doesn’t mention which film the script is for, but it’s not hard to guess. After all, this is the only thing the director’s been talking about ever since Split came out and it’d hardly make sense if he were to shift gears into another project at this stage. First week of writing the first draft of the new screenplay. 20pages. As per my ritual, I'm reading an Elmore Leonard novel to be inspired. While it’s good to know that Shyamalan is hard at work on the next chapter of this story, it’s tough to say when exactly we’ll actually see the thing get made. Yes, Split proved to be hugely profitable and audiences definitely want more, but there’s the issue of rights. You see, Unbreakable belongs to Disney, and while the studio was willing to let Shyamalan use Dunn for a cameo free of charge, they now want in on the action for the next film. Of course, there’s no reason Universal and the Mouse House can’t work together on the project, but it’s going to take a while for the deals to be made and everything to be sorted out. Not to mention that McAvoy, Willis and Samuel L. Jackson are all extremely busy men, so who knows when everyone will be available to shoot. Still, the sequel is finally a go and after all these years of waiting, that’s incredibly exciting to hear. 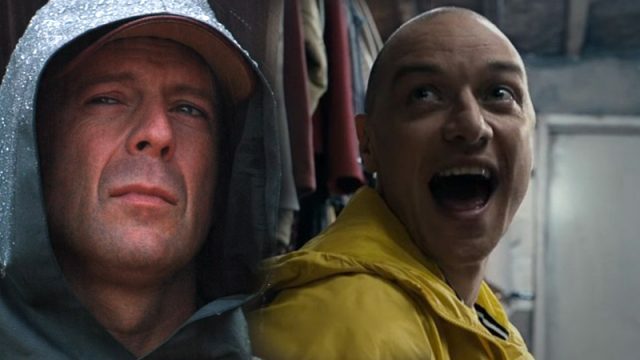 Tell us, what are you hoping to see M. Night Shyamalan deliver with Unbreakable 2? Sound off with your thoughts down below!